Hanging out where it does near the extreme south end of the Americas, Chile may be an unknown quantity for some. The first things to come to mind would likely be military dictatorship, earthquakes or the recent mine rescue operation of Los 33. Having been here for 19 months, here are a few observations on other things I’ve learned during this snapshot window of time. 1. People here are fun. There are cafés and bars and people talking all over the place, usually with a cigarette in hand. Public displays of affection are fully sanctioned, with pololos (girl/boyfriend) letting everyone know how into each other they are. The official religion is Catholicism, but Cafés Con Piernas are all over. These are coffee shops with attractive ladies serving up the java. The high-class ones are visible from the outside, while the seedier locales have blacked-out windows, and more than just caffeine for sale. Television sets are not found in the living room. It can be hard to get people to open up sometimes because it seems that there is still fear of others that was distilled into society due to the divided politics that persist after years of dictatorship. Trust is not instantly granted, but when it’s earned it’s real. Most things are an excuse for a party, a carrete (drinking fest until the wee hours, or if its independence “day”, up to five days of partying) or a cookout on top of a hill overlooking the city or along the coast. A seemingly serious group of people takes their play time very seriously, and in general, are seriously fun. 2. Hot dogs and instant coffee. If you want real coffee, you have to ask for café café or you will be served powdered junk. The tradition here has been tea drinking, along with small sandwiches and cakes. Teatime is called onces, which is the plural of eleven. Some say this comes from following a European time clock for the taking of tea, others say that the miners used to work 11 hour shifts, followed by tea and snacks. The other theory is that it comes from the eleven letters in the word aguardiente, a strong spirit that women would secretly pour in their cups (it was a secret because it was unladylike to consume alcohol), and by suggesting is was time for onces it was time to take a little nip. Completos are hot dogs slathered in mayonnaise, relish, ketchup, and more, and served everywhere all of the time. Aside from fast food, Chile has a great number of delicious dishes that blend indigenous and Spanish cooking traditions. Although the classes within Chile are very marked, and frequently socialize separately, there are strong indicators of solidarity in the broader sense. The annual telethon that unites all public media to support children with disabilities, the united front facing the 8.8 magnitude earthquake that hit in February or the successful rescue of 33 trapped miners that has been a source of great pride for many. The families of the miners constructed Camp Hope and waited on-site for their loved ones, with many artists visiting to keep them entertained. Most Chileans I’ve spoken with openly discuss the fact that there are very strong class indicators, with most rarely shifting from one to another or interacting with people outside of their group. From the castigated class of flaites to the long-standing upper class of cuicos whose wealth is concentrated and familial, each group lives where it is “supposed” to live. The dialects are also so marked that it can be difficult for people to understand speech patterns of a different class than their own. Marketing terms like ABC1 are commonplace and used to assign people to financial groups. Many of the ownership class are also very white, having been established when Spain first began colonization. Many Peruvians and Bolivians come here to work in housekeeping and are frequently looked down upon. While I would not characterize the capital city as less safe than Chicago, for example, there tends to be a lot of small-time robbery–cell phones, portable music players and bicycles especially. It may be that I’ve been ripped off many times because I look foreign, so some people assume I have money. A percentage of taxi drivers like to play change-making games to confuse their fares, or simply rig the meter so that it charges more. Maybe if they earned tips they’d be less likely to try these tricks. The lingua franca is Spanish, but there are a lot of German-speakers in the south as well. There are many indigenous languages spoken such as Mapudungun, Quechua, Aymara, and Rapa Nui (Easter Island). English words pepper the Spanish, like “Que heavy” or “Sorry” (but trill the R). Overall, Chilean Spanish for non-Chileans is very difficult at first. Final s’s are often dropped and consonant sounds are barely kissed instead of really spoken. Like the most popular word here huevon which conveys everything from “Hey Buddy” to “You are an Idiot.” It sounds like “weon” and is adjustable to every part of speech, like the common F-word in English. Another ubiquitous saying is “Cachai? which means “You get me? Understand?” from the English word catch. If you speak Spanish you may notice that instead of putting an s on the end of cachai, it has an i. A lot of verbs follow this format, like teni instead of tienes or queri instead of quieres. Aside from trying to understand the sounds of pan-Spanish words, Chilean Spanish is extremely inventive and original (due at least in part from geographic isolation and years of a dictatorship that limited cultural imports). While fun, it’s complicated. There are entire books written about it. A Mexican friend living here remarked that he spent his first few months here nearly in tears, trying to understand this version of his native language, and failing. From top to bottom, the length of Chile is about the distance between the east and west coasts of the US, but it’s only a few hours drive from the Pacific Ocean to the Andes Mountains and into Argentina. 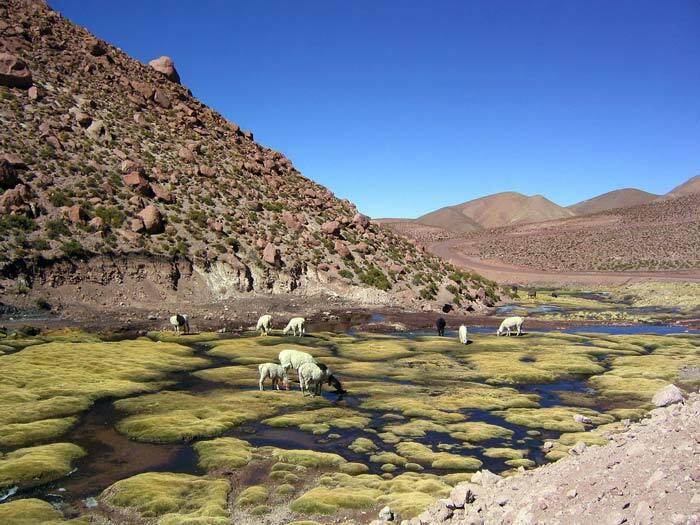 From the Atacama Desert in the north, the driest on earth, to the glacial, splintered southern Patagonia, it has the widest climate variation of any nation. The desert most resembles a Martian surface, and the skies are the clearest on the planet, making it home to the most impressive observatories around. There is even a flowering desert that comes alive in full bloom roughly every 5 years, creating a scene plucked from Alice in Wonderland. Part of this amazing geography includes large amounts of minerals such as gold, and some of the highest concentrations of copper in the world. While this has helped Chile remain economically stable during the recent global swings (the state saves money from its copper revenue specifically for times like these), there are attendant issues of mine safety and pollution of groundwater, soil and individual health effects as well as over-exploitation of resources. The mountains that surround Santiago become invisible in the winter due to air pollution. The valley/mountain urban seat causes thermodynamic inversion, leading to this nasty situation. On days after the rain, the sky gets scrubbed and the mountains are dusted with powder, creating a truly impressive skyline. Other cities south of the capital rely almost exclusively on wood-burning stoves for heat in winter, which creates another type of cloud hovering over the populace. The upside is that also due to the wide range of topography, the potential for renewable energy is very high. 10. Any novice can grow plants here. In winter the US gets much of its produce from here, clearly because of the seasonal flip between the hemispheres, but also because crops grow like weeds and taste like ambrosia. One can purchase ultra-fresh deeply pigmented produce nearly everywhere, and for very little money at the open-air markets. There are fruits here like lúcuma, chirimoya and others that I had never heard of, and could never describe because of their singular flavor. Wine is another important product, and even the inexpensive ones are often fantastic. Carmenére is known as the Chilean red, but many other varietals are represented, and often at astonishing prices.